Golden Apples: Pile Them On! Orange is done and red raspberry , too. Now on to the cherry red! These socks are quickly becoming one tall order of ices! The socks are getting tall—I wanted deep stripes, not wimpy ones. So the leg is now just a bit over 6.5 inches tall. I am thinking, there are 2 choices—a taller than average sock—or a heel and gusset of cherry red. And I have already decided: it will be the latter. I like the idea of bringing the stripes into the instep of the sock. Then, after the gussets are done, I'll finish the foot and toe with chocolate brown. What do you think? For sure, we can agree, they look so much better on the LEGS than they do flat! 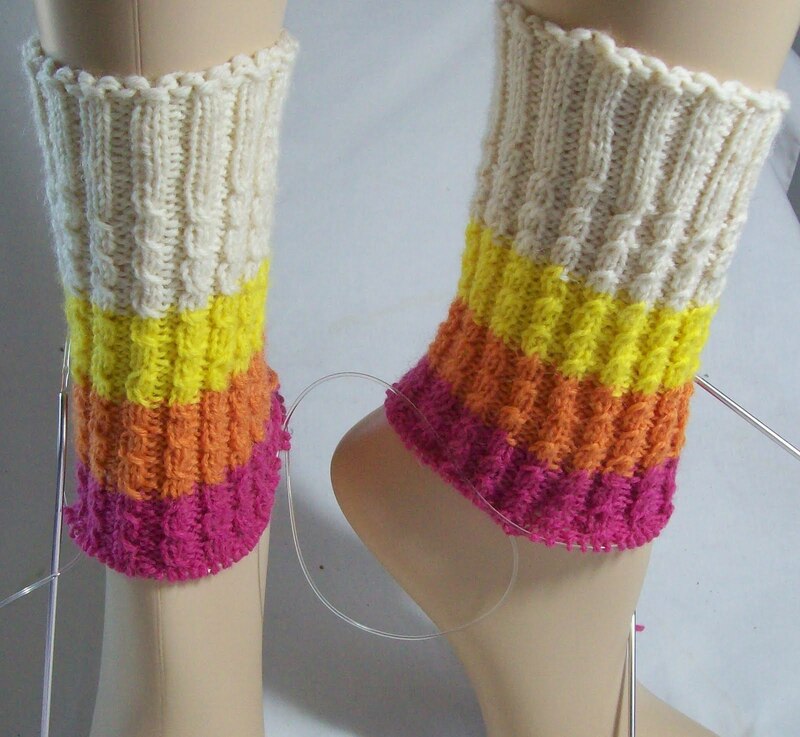 These are fun, happy socks—Simple ones as socks go—but I do tend to alternate fancy –color work, or lace or beads, with simple patterns that are almost thoughtless—especially socks were the self striping pattern does most of the work. This twisted ribs take a little thought, and a little effort but mostly they are pretty simple to knit. The other big effort is weaving in the ends—and I've started that already. White to yellow, and yellow to orange tails as well as the cast on tail are all woven in already. Not every tail, but enough so finishing (and the rest of the ends ) won't be oppressive. These socks are sort of free-be's—all the yarns are left overs-Except for the brown to come. And there is still left over yellow, and left over orange and left over raspberry. And there will be left overs of the cherry red, too. I think the single skein of brown, divided, will be more than enough for the less than half a foot, and will generate left overs of brown, too. I keep waiting to get bored with sock knitting. but its almost impossible! There are so many details that can be altered—so many stitch patterns, so many great sock yarns. Already, I am thinking about what pair will be next—and have already decided that my pumpkin pie socks will September's choice—that way I'll have them finished in time to enjoy them and pet them before they get worn in November. Octobers socks, will be something simple, and August? Lace I think—but a simple one. Crazy 8's maybe the last pair for the year. It really looks like you are serious for what you are doing right now i think your good at your chosen craft. Good luck! Love those bright colors! They're awesome.